A true champion of healthy family nutrition and citywide wellness, Kristin Groos Richmond currently serves as Chief Executive Officer and Chairman of Revolution Foods, the company she co-founded in 2006 with a mission to transform the way students in the U.S. are fed by serving healthy, delicious and affordable meals in many of our nation’s most at risk communities. Her efforts to tackle the growing obesity trend and expand access to healthy food beyond the lunch line have helped uplift families and whole communities nationwide; her company has now designed, produced and delivered over 320 million kid-inspired, chef-crafted meals to school and community sites, including childhood education centers, districts, charter schools, and community and afterschool youth programs, across over 400 cities and towns. 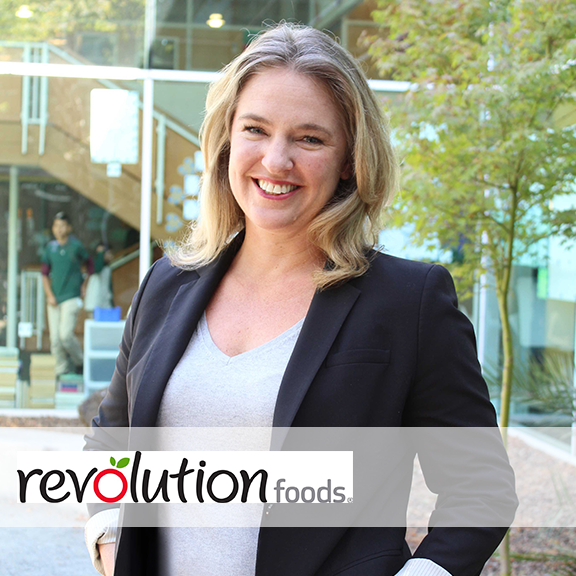 Revolution Foods is projected to generate $170 million in revenue in 2019 and is funded by world-class investors including Revolution Growth, DBL Partners, Prudential Financial and Emerson Collective. Much of Kristin’s life work has been dedicated to helping youth achieve greater academic outcomes and unlock their true potential. Prior to founding Revolution Foods, she was Vice President of Resources for Indispensable Schools and Educators, where she devised a strategy that grew the organization to a nationally scalable model working with teachers and public schools. From 2000 to 2002, Kristin lived in Nairobi and co-founded the Kenya Community Center for Learning (KCCL). She began her career at Citigroup in Investment Banking. Kristin was a member of the White House Council for Community Solutions and is a board member of KCCL, Lighthouse Community Charter School, and U.C .Berkeley’s Global Social Venture Competition. She is also a Pahara-Aspen Fellow, an Education Pioneers Fellow, and an Ashoka Fellow. NewSchools Venture Fund named Kristin and her co-founder, Kirsten Tobey, Entrepreneurs of the Year and they also won the Global Social Venture Competition for the Revolution Foods model. Kristin is a Young Global Leader of the World Economic Forum. Kristin holds a B.S. in Finance and Accounting from Boston College and an M.B.A. from U.C. Berkeley. She lives in the San Francisco Bay Area with her husband Steve and two sons, Watts and Caleb.